Area Love’s Travel Stops & Country Stores recently wrapped up a five-week campaign, raising more than $26,000 toward their sponsorship of a new and expanded Radiology Room at Children’s. 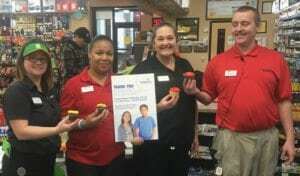 The Love’s team in Belleville, KS (pictured here) earned top honors this year as the number one fundraising store in the district. Previous post: Creighton Dance Marathon is a Success!